Two partners and a Today. You’re Under Arrest: Full Throttle (逮捕しちゃうぞ：フル・スロットル, taiho shichauzo: furu surottoru) is the third season to the You’re Under Arrest! franchise, and it starts off with a bang. After training with American police forces, Kobayakawa Miyuki returns to Japan to rejoin the Traffic Section at Bokuto Station. On the way, she meets a boy named Randy being chased by men, and escorts him back to his family. The You’re Under Arrest! canon follows in the order of the OVA, TV season 1, mini-specials, movie, TV season 2 (released in America as YUA! : Fast and Furious), the end of season 2 special, and Full Throttle. With the exception of the angsty action movie, YUA! was always a comedy anime, first and foremost. The humor dealt with the daily shenanigans of the traffic police stationed at Bokuto, and the TV series were told in a slice-of-life way of storytelling. One of the recurring issues is the relationships between Miyuki, her patrol partner Tsujimoto Natsumi, and motorcycle officer Nakajima Ken. After the lackluster No Mercy!, the season 2 special that was basically having YUA! in an American alternate setting, TBS animation relaunched the franchise with Full Throttle a few years ago. I can see there was a pretty serious decline in the quality of the writing. The first two episodes of Full Throttle led me into thinking YUA! switched from being a comedy to an action series. That was not my problem. My problem was Randy just getting dropped from the story after the second episode and the series switching back to a comedy series. Even then, it just failed to recreate its former self. The humor simply isn’t as funny as it was in the older series, and I feel character development has more or less stagnated, and in some cases, taken a few steps backward from the end of season 2. This was most notable in the case of Miyuki’s and Ken’s romance. Season 2’s ending made it seem that it was finally going to take off, only for it to regress back to the carefully dodging such things as dates or marriage proposals because while they very much do love each other, they’re too shy to admit it to one another, or anyone else. I think another problem with the writing is that the episodes are a little predictable. I felt that I could never really expect how episodes in the older seasons would end, but that wasn’t really the case here. Overall, the individual episode plots just feel a bit less involved than before, and consequently the episodes aren’t as memorable as they used to be. Finally, I couldn’t help but feel that the ending was just a tad…half-assed. 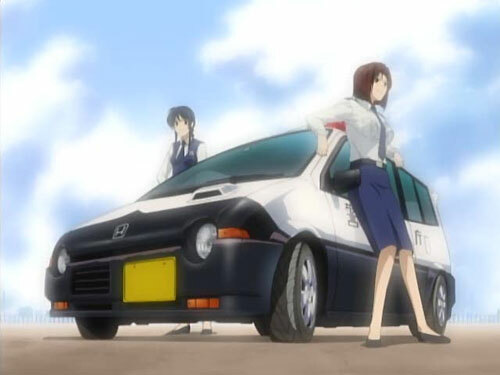 The last two episodes of the story (the actual last episode is a special surrounding Yoriko and Aoi) are about the police officers pursuing a vigilante race driver. The problem was the antagonist was such a half-baked character, and ultimately he served to be little more than an excuse for Miyuki and Ken to finally really start interacting with one-another; that was something the series somehow managed to dodge up until then. There was the subplot of him seeking revenge for the death of a woman he loved (if I remember correctly, it didn’t say how the woman was related to him), and I ultimately found myself not really caring. Visually, Full Throttle looks ok for the most part. I’m not really a fan of the updated character designs. Full Throttle looks like it’s trying to look more like modern anime and ditches the classic look that more closely resembled Fujishima Kousuke’s manga designs. I can’t help but feel that Miyuki looks old, but it works because time has transpired since the beginning of the OVA. Also for better or worse, I can’t help but feel that female’s breasts in this series somehow seem more noticeable than they ever did before. Pretty much any scene that involves cars driving down a street looks absolutely hideous. Cars just look like cel-drawn models sliding around the road as wheels are usually drawn in a way where it’s impossible to tell if their rolling or if their hubcaps simply have no detail. You can thank the clumsy use of computer-assisted animation. However, there was one instance I did see a car with more detailed hubcaps, and the wheels just weren’t turning. So the car very much did appear to just slide along the road. Despite the fact that the first season looked noticeably older than other anime of its time, that was something I could reasonably expect to not happen largely due to the fact that CG wasn’t used at all back then. The worst part? As this anime centers around traffic police, you can expect to see a lot of action out on the street. The music was a mixed bag. The tunes that play throughout the episodes generally fit the mood nicely. I wasn’t a fan of the opening theme, though the ending song “1/2” was a little better. Generally, the music helped reinforce how Full Throttle had taken a turn for being a little more dramatic than the other series. Otherwise, the soundtrack was nothing particularly memorable. The voicecast from previous anime have returned, and overall they do a good job, but some actors, like Hiramatsu Akiko (Miyuki) are pretty audibly older than they were in older series. It does make sense that the characters sound older because they very much are older. Ultimately, what I found frustrating was how the characters were going absolutely nowhere over the course of the series. Season 2 gave a lot of character development, and some of it felt undone in Full Throttle. What I mainly point at is the Miyuki/Ken relationship. The characters were always the strength of the earlier series. By now however, it just feels like everyone is just sort of dragging their feet. To be more blunt, the characters just aren’t as interesting to watch as they used to be, and I feel YUA! probably should have ended at the conclusion of the second season. To give you a better idea of how I feel: I rewatched a few episodes of the first season not too long ago, and found myself thinking both times, “Wow! That was pretty good!” That was not the case at all with any of the episodes I marathoned in Full Throttle. Overall, Full Throttle just lacks the charm that the earlier seasons had.